When I first thought about becoming a parent, I thought that I had learned a few things from my years of teaching that would serve me well as a mom: The best children’s literature authors. The way to talk to teachers (as a parent) without annoying or overburdening them. The way to be involved in my child’s education and development that would not be anything like “hover-parenting,” but would be appropriately caring and involved. I wanted to take the best of both worlds of the two dichotomies of parenting styles: “intensive” or “hover-parenting” and the more hands-off, risk-encouraging form of parenting that I grew up with. 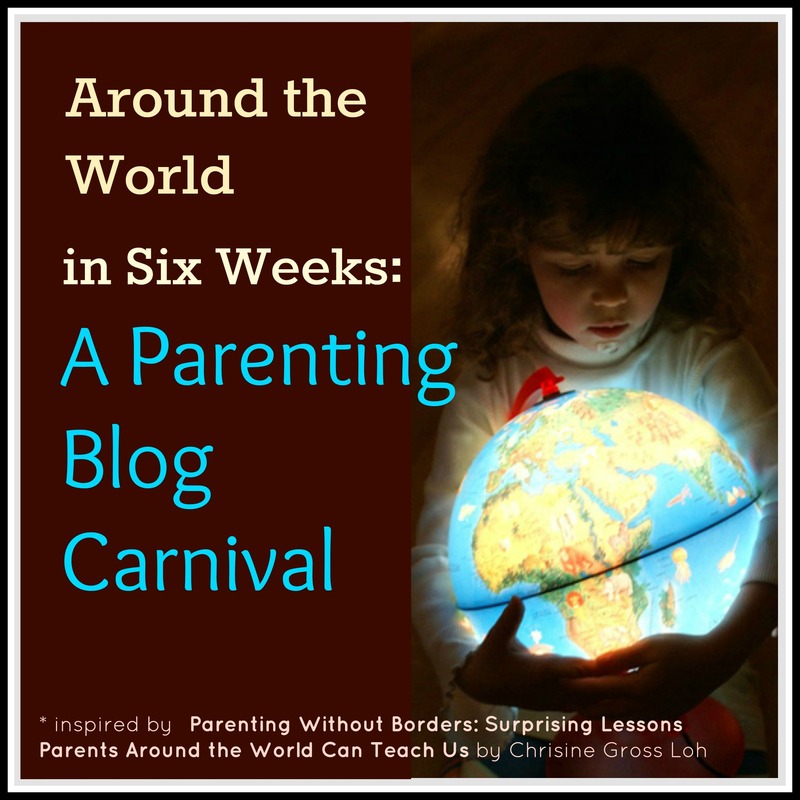 As I read Christine Gross-Loh’s chapter from Parenting Without Borders: Surprising Lessons Parents Around the World Can Teach Us for this week’s Around The World Parenting Blog Carnival, I realized again how difficult of a task this balance is. I was not surprised by the take-away message of her chapter — we aren’t helping our kids by micromanaging their lives — but I was, as always, impressed by the case that she makes about cultural differences. Yet again I realize that I’m not successful as this type of balanced parent. I just spent the weekend “hover-parenting” while on vacation with my son. (And this — because I’m just stepping back in the door right now from being out of town on vacation — is why I’m partially re-posting one of the first pieces that I wrote as a blogger.) Especially away from home, and away from the familiar routines of home and everyday life, I wonder if it’s even possible to find the balance between letting my risk-taking toddler son negotiate his own freedom and making sure that he doesn’t take too much risk. As I was chasing him around the beach, I wondered when you let go as a parent. Because I certainly — as the parent of a two year old boy — certainly haven’t gotten there yet, and it’s exhausting for both of us. Not all “helicopter” parents are the same. Yes, the term has become synonymous with parents who overmanage, spoil, or “hover” over their children to prevent them from facing any hardship or setback. But a recent Australian study suggests that there are subtypes of helicopter parents. Does categorizing parents really make a difference? Well, these parenting researchers who are worried about the effects of the influence of overparenting on schools and in the culture at large say that recognizing your parenting style is the first step in figuring out the appropriate level of involvement that is best for your child. 1.___ I want my child to feel like she’s my best friend. 2.___ When my child has a conflict with another child or an adult, I usually find that my child is right. 3.___ I get nervous when I’m not in constant contact with my child. 4.___ If my child were having trouble with a new seating arrangement in his class, I would ask the teacher to move my child to another seat. 5.___ I have found that most of my child’s teachers’ discipline policies were not appropriate for my child’s temperament. 6.___My child generally needs extra help from me or another adult with his homework because of his learning style. 7.___ I have found that my child gets bored or anxious with lots of free time. 8. ___ It’s difficult to find time in my personal schedule for my own outside interests or friends because my child’s schedule is so full. 9. ___ My child is gifted in many areas, and I spend a lot of time making sure that his special needs are met. Overly responsive to your child, if you answered true to Questions 1,2, or 3. Overly low demands on your child, if you answered true to Questions 4, 5, or 6. Overly high and overscheduled expectations for your child, if you answered true to Questions 7, 8, or 9. Now, obviously, your child could really be gifted or have a genuine learning disability (or any number of unique circumstances) that necessitate a high degree of parental involvement. Or, as psychologist Madeline Levine suggests in Teach Your Children Well: Why Values and Coping Skills Matter More Than Grades, Trophies, or “Fat Envelopes” the norms for parenting could have so changed that we don’t even recognize that we ourselves could be helicopter parents. She argues that just because your child isn’t overscheduled or you aren’t parenting out of a need for your child to obtain riches or material success, this doesn’t mean that you aren’t a different sort of helicopter parent. According to the Slate article, “We Are All Helicopter Parents,” we may think our parenting style is normal because everyone around us is doing it. And the Australian study — published in the Australian Journal of Guidance and Counseling — confirms that helicoptering parenting’s prevalence is widespread, at least among the middle and upper class. The study consisted of an online survey of 128 parenting professionals — teachers, psychologists, counselors. Nearly 65% could describe behavioral examples of overparenting that they have witnessed. These descriptions ranged from confronting other parents when a child is not invited to a birthday party, cutting up food for a 10 year old, bringing special plates of food for a picky adolescent eater to a party, and sending middle schoolers to special camps because they are unable to dress themselves. Only 8% of the professionals said that they could not name cite examples of helicopter parenting from their own experience. From my own teaching and educational career, I could cite lots of other wild examples. A parent who was found digging through the trash in my classroom because she wanted to read any notes that other classmates were writing about her daughter. Another who would e-mail me suggested seating chart diagrams for each of her daughter’s classes all day so that she could interact directly with only the students with whom she worked best. Parents that I found hiding in the bushes of the school yard, recording observations of their child at recess and the other children’s behavior. As the lead researcher of the study and Queensland University of Technology professor, Judith Locke, states, more effort at parenting does not necessarily result in a happier, more successful kid. In fact, helicopter parents may be increasingly creating children who are unable to deal with failure and have insufficient coping skills for life outside their homes and families. Will today’s children miss developmental milestones — being able to walk home from school or crossing the street by herself — that kids of past decades met at much younger ages? A parenting book about six year olds from 1979 suggested that one milestone that should be reached before a child is ready for first grade is being able to walk or travel alone through his or her own neighborhood. Will today’s children be less resilient, more anxious, less responsible, and more entitled? From my own observations as a teacher, parent, and researcher, I think that we are actually a generation of involved, caring, and loving parents. We truly want what’s best for our kids. What if all of us — and, again, I’m talking about those of us prone to overparenting, since we have a whole other societal problem of children, as Paul Tough has written about, who face too much adversity — try to do less? What if — when our child faces a problem, large or small — our first reaction is to listen and to step back? An Australian article discusses the effectiveness of simple parenting workshops to attempt to curb the trend of overparenting. And some have seemed to work. Parents of young grade school children were reminded that their children should be able to take independent risks and were convinced that less intervention by parents would result in more confident children. How do you make sure that your child develops coping skills to become an independent learner and thinker? My list goes on and on. Their intention was to protect me, but as a result, I had to learn simple, life skills as a young adult, and I am still working on trusting myself, because they never allowed me to practice decision making or doing “scary” stuff. Not quite the type of helicopter parenting in which you are putting the kids in a million classes, but definite micromanaging of their lives. Wow, that’s tough. That’s exactly what this book — as well as all of the research on adversity and grit — is trying to prevent. The good news is that you DID learn those skills. Such a thoughtful post, Jessica, and I love the other research and writing you have brought in. I just read Stephanie’s post for today, and I think she managed a great blend between intervening to help her child when she needed it, but still making her child take some initiative to advocate for herself, as well. Obviously, as a teacher, I see the parents who do too much… and it shocks me when, since I teach 16 year olds, it’s the parents who email me asking to help their child, rather than the student emailing me. So much to think and talk about on this topic! Hope you are all recovering from the vacay! I answered false to every single question. So am I any kind of helicopter at all? That said, I don’t see how answering false to 4-6 means overly low demands on my child. Or what does “overly low demands” mean? I would just tell my kid to talk to the teacher about it. Attempt to work it out him/herself. If the teacher were to blow her off, then I might step in. Kids need practice advocating for themselves. Not my job to undermine the teacher’s authority. More important question- why is my kid needing to be disciplined? If my kid is really misbehaving in class then he/she better stop. Temperment-shmemperment. Follow the rules. If you don’t get in trouble, the teacher’s discipline policies are irrelevant. My daughter is really chatty, and at times she’s removed from circle time for not sitting still and keeping quiet. The teachers explain- as though to make an excuse for disciplining her, and I’m just like, “Hey, do whatcha gotta do.” And then I let my daughter know that I’m unhappy she wasn’t cooperating. I answered N/A to this because my kids are too young for homework just yet. What constitutes extra help? Why is is due to learning style? Short of diagnosed learning disability, struggles are part of learning. I remember crying over math homework in 2nd grade. Did I need help, yes. Was it due to my learning style? Probably not, more like my frustration level at mastering something that wasn’t inherently easy for me. I am pretty much just absolutely NOT a helicopter parent. I don’t think my husband is either, but he’s the worry-wart parent. I’m the ‘let them figure it out themselves’ parent. I really feel like it’s my job as a parent to raise an independent kid- meaning I teach my 3.5yo to speak up for herself, do things herself, learn things herself, etc. She should be able to go with the flow. Momma, PhD recently posted…Everyone’s a little bit racist. I think you can forgive yourself for hovering a little over the two-year-old :). Anyway, I forgive you. Just don’t start doing his play school homework. Killer quiz. I think other parents look at me and judge me negatively for not stepping in more. I’m definitely more laissez-faire. I have been trying to train myself since they were born to let them learn without being in their way. It is hard to let go, but it is also essential. Good post. It made me think about what I can do better. My mom was a helicopter parent. I hated it. It took me years to learn to function on my own as an adult. It really did cripple me as a human being. My husband and I decided we were going to be free range. My daughter is 10. She is so confident and competent. She seems years more mature than other kids her age and proudly does most things herself. She actually gets a little weirded out by the over dependence on parents other girls her age display. She has actually asked me what is wrong with children and parents. I am just so proud of her. She feels a sense of responsibility for herself and actions. She owns up to things, and works hard, knowing that she is in control of things like her grades, school conduct, etc… As a result of all of this, she is so easy and pleasant to be with. That’s so interesting. Someone should do a study of kids who feel that they were “helicopter” parented as children. (Maybe there has been one.) The great thing is that you got enough perspective to learn that this isn’t what works in raising confident, independent children. I hope that my son turns out just like your daughter! I also thought it was good food for thought about which *kind* of helicopter parent you are. There are so many ways to be overbearing… Our parents made mistakes and so will we. Other ones. But we won’t be perfect. That’s a lesson to take out of this for all of us straight-A overachievers, too. In the end, the most important thing is to be aware of your style, your potential pitfalls, so you can prevent yourself from swinging too far in one direction or another. Like Momma, PhD, I answered false to every question. Do I not hover enough? I know I’m not a perfect parent by any stretch, but I’m comfortable with the balance my husband and I have found between stepping in and allowing our children to develop their independence through their own failures and successes. Great post, Jessica! That is exactly the hard part about toddlerhood! I don’t want to endanger his life, but I also find myself “hovering” way too much. I know this is also true. Hopefully, it’ll get easier to find that balance, as you did, as they get older. I am really enjoying these posts, because “helicoptering” is a big issue for me. However, I am also seeing that maybe I am not as bad as I thought. My main concern comes with physical safety, but I am trying to relax. 🙂 He loves sports, and I want to see him have fun with them without fear of getting hurt. I think some caution is OK, but we don’t need to put all of our anxious feelings on our kids. Great, insightful post! What a great post. This is all too true. It’s very hard to find that balance. You need to allow your kids to make mistakes, learn and grow. But on the other hand it hurts to watch them fail. Taking that quiz made me feel pretty secure in my un-hoverparet status, and reading your examples of the crazy business your students’ parents have taken part it sealed my satisfaction with myself. I’d like to find a quiz that compares parents cross culturally. Though, as Gross-Loh noted, there is not often a good set of universal questions since not all issues exist everywhere. Thank you for including me this week. I”m having a ball! I’m so glad that you could join us! I’m a big fan of yours! Did you think that quiz made it too easy to spot the “right” and “wrong” answers though? I might helicopter in other, more subtle ways, but I would be totally embarrassed to check the box next to a bunch of those answers! I thought this post was fascinating. It seems easier to identify helicopter parenting when the the examples deal with older kids. What about toddlers? What does helicopter parenting look like in the `15-24 month old range? It’s harder to identify because these kids do need a lot more assistance and could hurt themselves if given too much freedom. Loving this whole discussion. And what a good point in that Slate article (and from you as well) that we think what we do is normal just because so many around are doing it the same way. Interesting! I have never thought of myself as a helicopter parent but I do have difficulty finding time for me, between my children’s schedules and my work commitments. But I have three kids with different schedules and of course that necessitates me driving all over the place to get them where they need to be. Right now they are each playing one sport but there has been occasions in the past where my boys have done a school sport and an outside team. I’m not sure I would count that as helicopter parenting. Maybe it is though. Regardless, this is a good way to be aware! I’m not sure if that counts as a helicopter parent either! Maybe you’re just a busy parent! First, I wanted to say thank you so much for linking up to week 1 of The PINcentive Blog Hop! We are super excited you did. In fact, we liked your post on Your hovering doesn’t help so much; we chose you as one of our winners! Please let me know if you’d like to co-host at your earliest convenience. If you decide you would like to, please provide me with 3 methods (links) in which you’d like the entrants to follow you. You are also entitled to priority seating for week 2! This means the post you choose to enter will be one of first few in the link up! I will provide all cohosts the HTML for the blog hop post Monday morning. This should give everyone ample time to draft their posts and troubleshoot any issues that may arise with the code. Thank you and I look forward to hearing back from you! This is a tough choice to make. As a first-time mother to a toddler, I find it difficult to step back, yet I am very aware of the fact that I could be overdoing the parenting bit. I have always been independent-minded since childhood, and I want my son to be the same. I do find at times that he is too dependent on me, and that’s when I try to prod him gently to do things on his own. Thanks for sharing some wonderful insights! TK recently posted…Goodbye, sippy cup!